Dirge is an Imperial food vendor and a member of the Thieves Guild who works as the Ragged Flagon's bouncer. He will initially be found standing imposingly on the wooden runway leading to the Flagon from the Ratway, but will then start patrolling the entire span of the tavern. 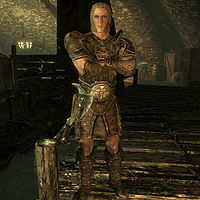 Befitting his role, he is clad in leather armor, bracers, and boots, and wields a leveled war axe (up to elven quality). He also carries a belted tunic and has a random chance of carrying some gold, lockpicks, food, drink, gems, or jewelry. "Stay outta trouble, or there's gonna be trouble." "Last person who made trouble for Vekel ended up with a smashed head." "Vekel doesn't like strangers snooping around the Flagon." "There's two things to do at the Flagon: spend coin and then get out." When you join the guild, his attitude won't improve one bit, even if you eventually become Guild Master. "Even if you're one of us, you better not make trouble." "I don't care if you're best buddies with the Guild Master. I'll still smash in your skull if you try anything." "The last person that made trouble for Vekel ended up floating in the canal... catch my drift?" If you ask him about his unusual name he'll be even less polite: "They call me Dirge, 'cause I'm the last thing you hear before they put you in the ground. Why? You think it's funny or something?" If you attempt to persuade him and fail, he'll cut you short: "Good. Now shut up and get out of my face." If you manage to sound convincing when claiming his name is threatening he'll loosen up a bit and offer you a bottle of mead: "Oh yeah? I think so too. You're pretty smart. Hey, here. Have one on the house." He'll also offer a bottle if you're intimidating enough: "No, no. Sorry if I sounded so mean there. My brother always said I have a big mouth. Here, have one on me." If you fail, however, he'll send you off by growling: "Yeah, my problem is I'm too tired to punch your face in." If you're suspended from the guild, he'll warn you: "You better straighten things with the Guild or you won't be welcome here anymore." If you talk to his brother Maul about the Thieves Guild, he'll tell you: "My brother Dirge works in their hideout. I used to run with them myself, but took a job with Maven after they started hittin' a rough patch." "Don't know his name, but there is a guy like that hiding out down here. Paid plenty for nobody to know about it. You're not the first person to come in here asking about him, either, so be careful." "Yeah, I think I know who you mean. He's paid good money for nobody to know he's down here, but I guess I can tell you." "That's interesting. Why do I care? You want a drink, or maybe just a few broken bones?" "Down in the Ratway Warrens. Nice place, if you don't mind the stench, rats, and assorted lowlifes as neighbors." "You know what? I think I do know the guy you're talking about." or "Maybe it would. If you had it." "A friend, huh? Well... then it's probably okay if I tell you." or "I guess you don't hear too well. I never heard of this "friend" of yours." "Easy there. I don't want that kind of trouble. Guy ain't worth it." or "Yeah. That's what it's going to take." If you press him to tell you who else is looking for Esbern he'll confide: "Various shady types I've never seen before. I'd watch my back if I was you." Tonilia: I need you to do me a favor, Dirge. Dirge: Sure, Ton. You know I'm good for it. Tonilia: There's a new guard nosing around the meadery. Can you do something about it? Dirge: Gladly. He won't bother you anymore, I promise. Vekel: Dirge! Did you take out the trash like I asked? Dirge: Yeah. Threw it in the lake like you said. Vekel: Tell me you looked through the trash before you did that. Dirge: Take it easy, Vekel. How long we known each other? Yeah. I checked it. All the stuff is in the safe. Dirge: Job's done, boss. Gave the package to her just you said. Vekel: Good. Did she say anything we need to know? Dirge: Yep. She said that the Jarl was planning a surprise raid on us, but she talked her out of it. Said she saved us a lot of trouble. Vekel: That she did. Very good. I'll tell Brynjolf. Dirge: You need to tell your boys to place [sic] nice, Delvin. Almost threw two of them into the well last night. Delvin: They aren't my boys. Do I look like the leadin' type? Dirge: You know what I mean. Tell your boss that rough is rough, but when someone pulls a dagger fun time is over. Delvin: I'll pass it along. Delvin: Good news. I found that dwarven hammer you were looking for. Dirge: You did? Thanks. I [sic] get you the rest of your coin by tomorrow. Delvin: Yeah, funny thing about that. The price was a hundred higher than I expected. Dirge: Vekel [sic], you have no shame. I'll get you the rest like I said. I want that hammer. Dirge: Hey Ton, you shouldn't cheat on Vekel. He's a good guy. Tonilia: What are you talking about? Dirge: Come on, everyone knows about you and Brynjolf. Tonilia: Well, everyone's wrong. Now why don't you just shut up about it. A Cornered Rat: Locate Esbern. If Vekel the Man were to die, Dirge would take over running the bar in the Ragged Flagon. However, since Vekel is essential, this will not happen during standard gameplay. As Maul is a Nord, it must be assumed the two had the same father but different mothers. After talking to Maul about him, Dirge was supposed to tell you: "Maul? Yeah. That jerk works for Maven Black-Briar now. Left me down here watching this garbage heap. I guess he's better at all that talking stuff anyway. I'd just mess everything up." However, the wrong dialogue variable is checked, so you'll never hear it. This page was last modified on 25 October 2015, at 13:41.